Thursday, March 28, you will be invited to a meeting with your manager and a human resources rep. This meeting is regarding a change in hours for the day shift staff in your department. Your local unit executive team had an opportunity to meet with management to discuss this proposal. The discussion centered around staggering the shift start times to better accommodate patient care and to address inequity in low census. We told management that the nurses need to be involved in solutions to scheduling problems. We hope that you will take this opportunity to give your feedback. We strongly encourage you to review your contract, section 7.1, Work Week and Work Day. Management does have the right to modify work schedules with adequate notice. Because we want to address any concerns that may arise, Local Unit Chair Kim McClure and WSNA Nurse Rep Sue Dunlap will be attending this meeting with you. Contact WSNA Nurse Rep Sue Dunlap at sdunlap@wsna.org if you have any questions. Please welcome WSNA Nurse Representative Sue Dunlap, MSN, RN, COS-C. Beginning Monday, Dec. 3, 2018, Sue D. will be taking over all new issues as they arise at Island Hospital. I will finish up most outstanding matters to their conclusion and assist Sue in the coming months as needed. Sue D. can be reached at sdunlap@wsna.org or 206-575-7979, ext. 3005. It has been a pleasure working with all of the Island RNs for the past three and a half years. I am continuing my work here at WSNA as a nurse representative with a few new assignments. I will miss Island RNs but know you will be in good hands with Sue D.
Announcing new local unit officers! Thanks to everyone that voted in the recent Local Unit Officer election. We had a record number of ballots returned! First – thanks to the Island nurses who were able to turn out for one of the local unit meetings we held on July 12. We are hearing that Island nurses want information, updates and opportunities for involvement as we work together to build a stronger bargaining unit! Nurses have questions/concerns regarding low census rotation in relation to their staggered work start and stop times. We will be meeting with ER nurses to hear more about what is happening and decide how to address those concerns. Of note - In July, WSNA agreed to a 3 month trail of staggered start and stop times in surgical services. One of the issues we will be assessing during this trial is how Low Census rotation "works" r/t staggered start and stop times. We will be looking at both ER and surgical services department and bring nurses’ concerns to our labor management meetings (Conference Committee). The hospital must pay you for all time you work. There should be no retaliation from management for reporting overtime. If you are getting push back from your management, let one of your officers or Nurse Representative know. 19.1.3 Nurse Staffing Questions. A nurse questioning the level of staffing on her/his unit shall communicate this concern to her/his immediate supervisor who will utilize available management resources to attempt to resolve the situation. When appropriate, the nurse should initiate an Assignment Despite Objection form to document the situation, a copy to be given to the supervisor, and the nurse to receive a written response. Nurses who raise staffing issues shall be free from restraint, interference, discrimination or reprisal. Watch for a corrected ballot coming your way. Corrected ballots were mailed on August 2nd. Please let us know if you have questions. 16.1 Conference Committee. The Employer, jointly with the elected representatives of the nurses covered by this Agreement, shall establish a Conference Committee to assist with personnel and other mutual problems. The purpose of the Conference Committee is to foster improved communications between the Employer and the nursing staff and the function of the Committee shall be limited to an advisory rather than a decision-making capacity. Such a Committee shall exist on a permanent basis and meet at least quarterly and shall consist of representatives of management and up to five (5) representatives of the nurses covered by this Agreement. All members of the Committee shall be employees of the Employer. A nurse member shall be compensated for time in attendance, and shall coordinate release time requests with the nurse’s Department Manager. Interested in being a unit representative? Unit Reps act as a resource for nurses they work with regarding work/contract issues and help with communication between nurses, the local unit officers, and the WSNA Nurse Representative. Let us know if you are interested in this role – and /or if you have any questions. We are also thinking about ways we can give back to our community. Some of our ideas so far include providing school supplies, maybe coat/jacket drives – basically ways for us to be present and show our support for our community. Got a good idea? Please share it! Questions? Concerns? Please contact Sue O’Donnell, MSN, RN, WSNA Nurse Representative at 206-575-7979, ext.3045 or sodonnell@wsna.org. Oops! – We messed up – Watch for corrected WSNA officer ballots in the mail! The PINK local unit election ballot you are receiving contains errors/omissions. We apologize for the errors. We are resending you a BLUE corrected ballot with a postmark due date of Aug. 18, 2018. Please complete the Blue ballot and send it to us in the postage paid envelope. Pink ballots WILL NOT be counted. If you have questions, please contact WSNA Nurse Representative Sue O’Donnell at sodonnell@wsna.org or at 206-575-7979, ext. 3045. Ballots are on their way to you! You will be receiving a ballot for the WSNA Island Hospital Local Unit Officers elections in the mail within the next few days. Please mark your ballot and return it as soon as possible. The deadline for postmark is Aug. 12, 2018. Note that only active WSNA members may vote in elections. Not a member and want to vote? Contact WSNA Nurse Representative Sue O’Donnell at sodonnell@wsna.org or at 206-575-7979, ext.3045. Island nurses have questions about the recently negotiated contract, questions about how nurses can participate in WSNA, and ideas about working together to build a stronger bargaining unit. Join us for breakfast or dinner on July 12! This is a chance for you to speak up, voice concerns and bring your ideas about building RN presence in your hospital and community. We want to hear your questions, get your input and build a plan for moving forward together. These events are free for Island nurses represented by WSNA. If you want to purchase your own drink, a bar will be available during the dinner meeting. On Wednesday, May 9, 2018, Island nurses voted to approve a hard won contract. We thank all of the Island nurses who participated in the vote and are looking forward to building an even stronger bargaining unit as we move forward. We hope you will consider becoming an active WSNA participant. Four of five WSNA/Island Hospital elected local unit officers will be retiring/resigning their positions soon. We are looking for new leaders who will take up the good work of representing their fellow Island nurses as local unit officers. We will be holding nominations and elections for new local unit officers in the next few weeks. Nomination forms will be arriving in the mail soon. Remember you can nominate yourself for any position as long as you are a WSNA member in good standing. Questions? Contact WSNA Nurse Representative Sue O’Donnell at (206) 575-7979, ext. 3045 or at sodonnell@wsna.org. Your bargaining team recommends a yes vote on this contract. The new contract will not include incentive pay in any form! WSNA nurses at Island Hospital have clearly stated that we will not sacrifice our ethical standards or professional integrity by tying our wages to Press-Ganey or HCAP scores. This round of negotiations was marked by the hospital’s poor financial condition and the employer’s aggressive attempts to undermine existing contract language. Your bargaining team spent many dozens of hours, including 12 bargaining sessions (4 with a state mediator), pushing back on the hospital’s attempts to lower the working standards for nurses. The team is confident that the tentative agreement represents the best deal available to WSNA nurses at Island. Ratification bonuses – Upon ratification of the agreement, nurses will receive a bonus of $500 pro-rated by FTE (per diem nurses will be treated as a 0.2 FTE). Effective the first payroll following 11/1/18, nurses will receive an additional bonus of $500 pro-rated by FTE. You must be employed at Island at the time of the bonus payout to receive the bonus. Effective on the first payroll following ratification, the hospital will transition to a new step system with more uniformed movement between the steps. The transition to the new step system is an average increase in compensation of 1.8%. 11/1/18 – increase the wage scale by 0.5%. 11/1/19 – increase the wage scale by 0.5%. The bargaining team preserved nurses’ ability to plan vacations by preserving current contract language allowing a nurse to schedule a vacation as far in advance as possible. The PTO accrual cap will be reduced from 2 year’s accrual to 1 year’s accrual. The hospital will notify nurses affected by this change. Affected nurses will have 12 months to either use accrued PTO above the 1 year cap or cash it out. The hospital has committed to working with affected nurses to ensure you will be able to schedule PTO time during the 12 month period. The EIB accrual cap will be reduced from 720 hours to 520 hours. Nurses who have more than 520 hours will not lose any time. However, you will not earn any new time until accruals fall below 520 hours. The bargaining team preserved the current language allowing nurses to opt out of using PTO time when your department closes on a day you were scheduled to work in observance of a holiday. Effective 1/1/19, nurses in departments operating Monday – Friday will no longer be eligible for the shift differential. WSNA will withdraw its pending grievance. In consideration, nurses who work in Oncology will receive a bonus of $750 pro-rated by FTE on the first pay period following 1/1/19. Callback hours Callback hours will not be considered part of a continuation of the normal work day shift and WSNA will withdraw its pending grievance. The bargaining team fought this move to the very end and agreed to this compromise only when advised by both the attorney and the mediator that the Association’s chances of winning the grievance were poor. The bargaining team was able to win a larger ratification bonus for all Island nurses in consideration for this move. Per diem nurses will advance to the next step of the wage scale after 24 months – regardless of the number of hours worked. The hospital will publish a draft schedule by the 5th day of the month immediately preceding the month in which the schedule becomes effective. Nurses must make requests for days off or extra shifts by the 1st day of the preceding month. Per diem nurses must submit their availability by the 10th day of the preceding month. The hospital must notify WSNA of all disciplines imposed. 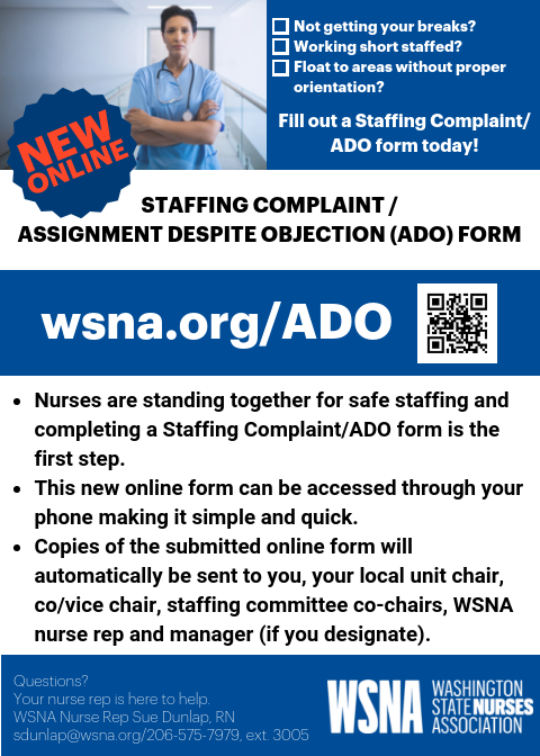 Nurses will have the right to request removal of any discipline in your personnel file if there has been no reoccurrence of the problem for 3 years. The new contract strengthens the voice of nurses at Island by enabling all 5 of your local unit officers to participate in the Conference Committee. When: 7-9 a.m. and 2:30-7 p.m.
For questions, please contact Sue O’Donnell, WSNA Nurse Representative, at 206-575-7979, ext. 3045 or sodonnell@wsna.org. Negotiation update #12 and contract vote! Your bargaining team reached a Tentative Agreement with Island management on Monday, April 23. The team recommends that nurses vote to ratify this agreement. These negotiations have been heavily influenced by Island Hospital’s current financial distress. The team is happy to report that we fought off the hospital’s attempt to tieour wage increases to Press Ganey scores. We strongly believe that using Press Ganey scores to determine nurse compensation is unethical and would serve to undermine both our profession and our relationship with our patients. There will be no incentive pay in this contract! Vote will be held on May 9, 2018 from 7 - 9 a.m. and 2:30 - 7 p.m. in the Cypress Room. Members of your negotiating team, including WSNA attorney and lead negotiator, Lane Toensmeier, will be available to answer questions related to the contract. Questions? Contact Sue O’Donnell, WSNA Nurse Representative at 206-575-7979, ext. 3045 or at sodonnell@wsna.org. Our eleventh contract negotiation session took place yesterday April 9, 2018. This was our 3rd session with the PERC mediator. Your bargaining team has fought, and will continue to fight, for a contract that respects the contributions that nurses make to Island Hospital. The hospital has maintained its unacceptable demand to for incentive pay tied to Press-Ganey scores. In addition, they have continued to push an agenda of takeaways from our contract language while rejecting the safe staffing committee language that we want to keep our patients safe. We are scheduled to meet for another session on April 23, 2018. It is time for all of us to step up and show management that we deserve a fair contract and we want it now. Your negotiating team members are distributing window signs to place in cars, home windows and business windows. We are also distributing YARD signs and postcards, and we are asking for your help! Tomorrow, Wednesday 4/11 we will be parked on 25th and Commercial from 2:30 – 4:30 pm distributing signs and postcards. Come pick them up! If you aren’t able to come by tomorrow just let one of us know and we will get them to you. On Thursday, Feb. 15, Island nurses stood strong together in support of their negotiating teams’ continuing fight for a fair contract! Island RNs assembled at the Board meeting holding signs with messages to the Board members. Rozetta Ludwigsen, WSNA/Island Chair, was invited to speak to the Board. Rozetta delivered a clear message to Board members. Negotiations are moving far too slowly. Nurses will not accept incentive pay and other unfair takeaways. Members of the Board need to show their support for Island patients by supporting Island RNs. Your negotiating team met with the PERC mediator before the board meeting and throughout the rest of the day. By the end of the day, we did not have a contract. We are planning to meet with management and the mediator again. Our action at the Board meeting showed that we are standing strong together. We will be sending management additional messages that we stand united.We will be counting on your continued support! Contact one of us to find out about how you can be involved. Your bargaining team met with the hospital for the eighth time on Jan. 2. No further agreements were reached. The parties have agreed to call in a mediator. We are scheduled to meet with the mediator on Feb. 5 and 15. In response to the hospital’s announcement of its plan to unilaterally implement its sick leave policy, WSNA has filed an Unfair Labor Practice with the Washington Public Employment Relations Commission (PERC). Washington state law requires public employers to bargain any changes to mandatory subjects of bargaining such as sick leave or PTO with the designated labor representative. By designating PTO hours that you will earn in 2018 as sick leave hours, and therefore unavailable for your vacations, the hospital has made a change to a mandatory subject of bargaining. WSNA’s complaint seeks an order from the PERC requiring the hospital to negotiate the issue with your team before the change is made. Your bargaining team will continue to insist that the hospital bargains in good faith with your representatives. Your bargaining team will continue to fight for a fair contract for the nurses at Island Hospital. We will let you know what further actions you can take to ensure we get the contract we deserve. In the meantime, please feel free to talk to us about the latest developments at the bargaining table and about how you can support the work of the team. We met with management on Friday, Dec. 15 for our seventh negotiation session. During our sixth session on Tuesday, Dec. 12, management presented us with an 11th hour proposal regarding the new Washington state sick leave law that will go into effect Jan. 1, 2018. Management’s initial sick leave accrual plan proposed intolerable reductions and restrictions on your PTO. Their revised sick leave plan, presented to us on Friday, still reduces and restricts how you accrue and use your paid time off. Management already has additional proposals on the table that would limit your PTO and EIB accrual and use. They also continue to push their plan for tying wages to incentive pay. We found Friday’s version of management’s sick leave plan to be a poison pill proposal your negotiating team can’t expect you to swallow as these negotiations continue to be about takeaways and give backs. Wear your buttons/stickers at work. Talk to your negotiating team members about next steps. See one of your negotiating team members to hear how you can volunteer to become actively involved in further actions! We are working on confirming additional dates in January to meet with management and a mediator to continue negotiations. We will let you know what dates we will be heading back to the table. We have now met with management for six negotiation sessions. As you know, these negotiations are moving slowly. Management has pushed for takeaway after takeaway and we have pushed back. Yesterday, management proposed their latest takeaway related to Washington Initiative 1433, which was passed by voters December 2016 and becomes law January 1, 2018. This new law is a good one for labor. It raises the minimum wage and requires most employers to provide sick leave to most employees. Under the new law, employees will receive a minimum of one hour of sick leave for every forty hours they work. At our negotiation session on Tuesday, Dec. 12, management presented their plan for complying with the new law. Simply put, they want to rob your PTO to establish a sick leave bank. Management has already proposed decreasing your PTO accrual and accumulation rates. Their new proposal could further limit how you accumulate and use your paid time off! Contact one of us if you haven’t had a chance to sign it yet. Wear a WSNA button and a sticker! Wear buttons/stickers every time you work! If you need buttons/stickers, let one of us know. We met for our fifth negotiation session on Monday, Nov. 13. While we have reached several tentative agreements to date, management continues to hold out multiple proposals that are not in the best interests of Island Hospital nurses. These include tying your wages to incentive pay, cutting your PTO accrual, limiting your PTO scheduling, reducing your EIB benefits and requiring you to be available to work two out of every three weekends. In in the spirit of the negotiation process, we studied the merits of your proposal (for incentive pay) and we found none. We discussed this with membership and the response was the same. Nurses are angry and insulted. Tying wages to incentive pay does not solve underlying system problems. It doesn’t address the reasons for low patient scores, including short staffing. During these negotiations, we have exchanged a number of proposals with management and we have reached some agreements but overall, we are seeing minimal movement from management. They continue to propose cuts to your PTO accrual, limits to PTO scheduling and reductions of your EIB benefits. Your work life balance is also in danger. Management wants to require RNs to work two out of three weekends, instead of the current one out of every two. Our next negotiation session is Monday, November 13. Talk to your team members and/or contact your Nurse Representative about how to support your negotiating team as we continue to represent the interests of Island RNs during these negotiations. Negotiation update #3 and local unit meetings! Your WSNA negotiating team met with management on Friday, Sept. 22 for a third negotiation session. Our next negotiating session is scheduled for Oct. 10. While we have reached agreement on several issues, management’s message in these negotiations seem centered on takeaways and limitations including tying nurses’ pay to incentives. Plan now to meet with members of your negotiating team on Tuesday, Oct. 3 to hear more about management’s proposals to give you less. Among their proposals are less EIB, limitations on PTO accrual and scheduling, fewer weekends off and less credit for step advancement. Drop-in Meetings will be held Tuesday, Oct. 3 at Island Hospital in the Cypress Room from 9 to 10 a.m. and 5:30 to 6:30 p.m. Questions? Contact Sue O’Donnell WSNA Nurse Representative at 206-575-7979 ext. 3045 or sodonnell@wsna.org. Your WSNA negotiating team met with Island management on Tuesday, September 5th for a second contract negotiation session. We were able to reach several tentative agreements during this session. However, we haven’t seen management’s economic proposals yet. What we have seen from management are proposed takeaways that will affect PTO, EIB, and per diem nurses’ availability/scheduling. It also appears the Employer is refusing to recognize the value of RN seniority and years of service. Our next meeting is scheduled for September 22nd. We expect management will provide us with their economic proposals at this session. We will continue to work hard and represent your interests at the bargaining table; and we will keep you posted as negotiations proceed. Please let us know if you have questions, comments or want to know how you can support your negotiation team as we work to improve working conditions at Island Hospital! Our WSNA negotiation team met with management on Tuesday, Aug. 29 for our first contract negotiation session. Thanks to all of you who took the time to answer the negotiation survey and participate in local unit meetings! Your input has helped us put together proposals that reflect the concerns of Island nurses. We presented our comprehensive list of proposals to management on Tuesday. These proposals include improved wages and specific measures to address safe staffing. Our next sessions are scheduled for Sept. 5, 22 and Oct. 10. We will update you after each session and we will hold a local unit meeting as we get further along in negotiations. Contract Negotiation Survey - Negotiations begin the end of August! If you haven’t already taken the survey please take a couple of minutes to fill it out. Now is your chance to have your voice heard. We have heard from some of you – but we want to hear from All of you! Your input will help us, negotiating team members, represent your interests during contract negotiations. It will be available until Thursday July 20th at 5 pm. Contract Negotiations will be starting soon and we want to hear from YOU! This is Your Chance to Get Updated and Involved! Members of the Negotiating Team and WSNA Nurse Rep will be available to hear your input about upcoming negotiation priorities and to answer questions about negotiations. We will conduct recruitment of Unit Representatives and update all members on Island current issues. Get ideas and plans for how nurses can be involved before, during, and after negotiations! If you have any questions, please contact Sue O’Donnell, WSNA Nurse Representative at 206-575-7979, ext. 3045 or sodonnell@wsna.org. Preparations for WSNA 2017 Contract Negotiations are underway! Update your contact information with WSNA Membership at membership@wsna.org or by phone at 206-575-7979. Attend Local Unit Meetings! Once the survey results are compiled, we will get together to talk about results. Watch for meeting dates and locations. Watch your email and this page for updates and additional information. The 2016 WSNA Union Leadership Conference in beautiful Lake Chelan is scheduled for Sept 25-27. Nurses from across the state will convene for an update on the national and state labor scenes, learn how to be more effective leaders in our own workplaces, celebrate our successes and strategize for what’s coming next. WSNA will be entering contract negotiations with Island Hospital soon. This conference will energize you, educate you, and make you a more effective participant in your profession and your union. Who knows – you may even be inspired to join the Contract Negotiating Team! Last year attendees received up to 7 CEUs for attending workshops and presentations. Your Local Unit Officers are sponsoring 2 Island nurses to attend the conference. You are eligible if you are a WSNA member. The sponsorships will cover registration costs and reimbursement of hotel costs and mileage. Contact one of your Local Unit Officers or your WSNA Nurse Representative Sue O’Donnell sodonnell@wsna.org for more information or to reserve your spot at this event. Your 2015-2017 Contract is now available to download. CDs will not be sent. On February 23, 2015, Island Registered Nurses approved the new contract by an OVERWHELMING majority. Thanks to ALL of you who worked hard and stood strong during negotiations. The contract will be available soon on the WSNA web site. We will notify you when it is available. If you have any questions, please contact your Local Unit Officers or Nurse Representatives. On Thursday, February 5, 2015, your WSNA Negotiation Team Members and Island Hospital’s Management Representatives reached a tentative contract agreement. Now - your vote on the contract is needed. Come cast your ballot! There will be a contract available at the vote for you to review before you cast your ballot. The attorney that negotiated the contract and negotiating team members will be present to answer questions. Members in good standing are eligible to vote. Membership applications will be available to allow you to become a member in good standing. Your Negotiation Team Needs You! WSNA and Island management have not yet reached a contract settlement. We will meet with management and a Mediator at our next negotiation session and we will be making important contract decisions that AFFECT YOU. Before that happens, YOUR TEAM needs YOUR INPUT - It is CRUCIAL that you come to a drop-in meeting to hear the issues and voice your opinion.